Warning: Restarting network service over the ssh session may result into total loss of the connectivity to the server. So make sure br0 and br1 configuration including routing set correctly. You need to use virt-install command. 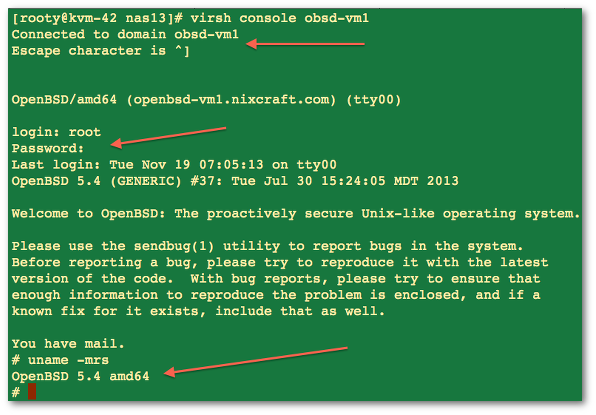 -n obsd-vm1 : The name of the VM. 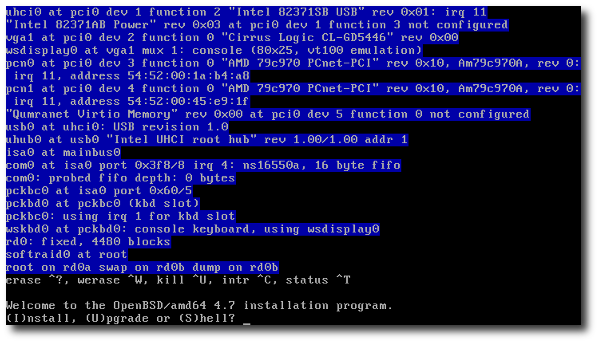 --description "cyberciti.biz OpenBSD 5.4 64 bit VM1" : The long description of the VM. --ram=1024 : 1024MB is the amount of memory allocated to the VM. --vcpus=1 : The number of virtual CPU(s) for the VM. --cpu host : Optimize CPU properties for the VM. --os-variant=openbsd4 : This is the VM OS type. --accelerate : Prefer KVM or KQEMU (in that order) if installing a QEMU guest. This option is no longer required. --cdrom /var/lib/libvirt/boot/install54.iso : Install OpeBSD v5.4 from an iso the location parameter. --network bridge:br0,model=virtio --network bridge:br1,model=virtio : Create a network bridge using br0 and br1 i.e. the VM will have two network interface for LAN and Internet. --graphics vnc : Use VNC to access installation using vnc server/viewer from your local Linux/OSX/Unix/Windows desktop. --disk path=/var/lib/libvirt/images/openbsd-vm1-cyberciti.biz.img,bus=virtio,size=10 : This is is the image file for the VM, the size is specified in GBs and I am forcing vio driver. The virtio driver provides support service for paravirtualized devices using the VirtIO protocol. How do I connect to OpenBSD installer from my local desktop? See how to stup SSH to tunnel VNC traffic though the Internets for more information. How do I start my VM after OpenBSD install is finished? How do I access a VMs console? Firewall, kVM & VMs security configuration. Attaching storage device to a VM. Changing VM parameters such as RAM, CPU, Disk and more. Managing and cloning VMs and more.